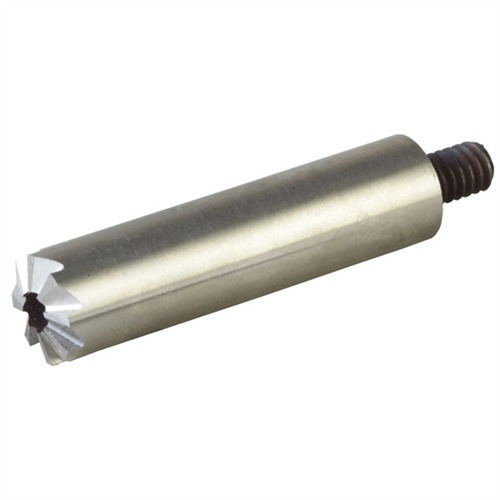 Hardened steel, muzzle crowning tool cuts a slight (11° less than square) target chamfer on barrels. Gives good rifling protection without going too deep. 90° - 11° = 79°, hence the name. Eight, precision-machined flutes give smooth, chatter-free cuts to help eliminate extra lapping or stoning. ¼"-20 thread fits Brownells muzzle chamfering handles. Use with our muzzle pilots to ensure precise alignment with your bore. Available in ½" and ¾" diameters to accommodate most rifle/handgun barrel diameters. Herdet stål, snute kroningen verktøyet kutt svak (11° mindre enn kvadrat) mål skråkant på fat. Gir god zappe beskyttelse uten å gå for dypt. 90°-11° = 79 °, derav navnet. Åtte, presisjons-maskinert fløyter gir jevn, prat-fri kutt å eliminere ekstra lapping eller steining. ¼"-20 tråd passer Brownells munnkurv festing håndtak. Bruk med våre munnkurv pilotene for å sikre presis justering med ditt kjedelig. Tilgjengelig i Dim ½" och ¾" diameter å imøtekomme de fleste rifle/pistol fat diameter. Spesifikasjoner: verktøy stål, 23/8"(6cm) lengde, ½" (1,3 cm) eller ¾"(1,9 cm) OD ¼"-20 tpi. I have shortened many barrels lately on Ruger Single Actions along with a few rifles. I will never go back to the file and stones mounted in drills. Very easy to use and gives a nice final touch. i originally bought this to do the crown on a savage 12bvss in 223 that wouldn't quite do 1/2 minute groups.i notice the factory crown looked a little rough and failed the q-tip test miserably . this tool made quick work of the factory crown . was a little worried at first because of the step in the factory crown . but with nothing but a drill an Brownells drill chuck adapter i was able to cut the factory crown down quickly and with absolutely no chatter marks . after the recrown the savage went from a .6 to .8 minute rifle to a .25 - .3 rifle . so i decided to use it on all of my rifles . this is one fine dandy of a tool that is easy to use and works better than i expected!! Easy to use with perfect results. I needed to repair a Ruger 77/44 damaged grown. First time for me,and took just 15 min. Results proved it self at the range,no more flyers. This is a solid built tool that does a nice job on my Mauser barrel. I was disapointed that it did not come with any directions about barrel crowning. Had to go online to find out how to use it correctly. I use it to do quick touch-ups to dinged muzzles and also when cutting and crowning. Works good and fast with good results. When I bought the pistol bubba had made contact with the crown and you could not shoot it. 20 minutes after using the cutter it was as good as new - maybe better. I ordered this to use on my Mosin Nagant Rifles. One was a Type 53 carbine with a dinged up crown. The other Mosin was a project 91/30 rifle. I cut the barrel back to 22", squared and cleaned up the crown with hand files and varying degrees of sand paper and finished it off with this crowning cutter. The 3/4" size was perfect for both rifles, although I had to order the .30 and .311 steel pilots due to differences in both sizes of the bores to avoid a wobbling pilot when cutting. I also ordered the handle to fit the cutter. I checked out several internet videos to see how to properly use the cutter, chose the correct size pilot, secured it with the set screw and used plenty of oil. I went slow using hand pressure only turning to the right. I stopped every once in a while to brush off the metal chips. It provided a very uniform crown. I cleaned up the crown with some 600 grain wet/dry sand paper. I am not a gunsmith but I do occasional small projects to my firearms. I was hesitant to do this job myself but it is real easy and anyone with some mechanical ability could use it. It payed for itself the first time I used it and saved me money the second time versus taking to the local gunsmith, paying him and having the firearms gone for several weeks. I recut the crown on an antique Spencer .50. The 501 brass guide fit perfectly. I used my cordless drill slowly. clean often...chatters a little. perfect! highly recommended for home gunsmith. This was the easiest gunsmithing project I have done to date. I own a few old Mosin-Nagant's and I needed to re-crown a couple of them and I was dreading doing this job because I thought it was going to be too hard and I'll screw something up. Nope, it only took 20 minutes per rifle and it was super easy with the correct pilot. I got both the .30 and .303 British pilots just in case and so far have only used the .30. I made the mistake, one time, of forgetting to add cutting oil to the bit between cuts. Good cutting oil makes a big difference to the ease of cutting. The cutter has the look of qood quality. It cuts real smooth and stays sharp for a long time. Very High Quality tool, cuts a great crown and leaves a very nice finish. Use plenty of cutting oil and clean chips often and this tool will give you great results. This cutter works pretty well. It takes a little practice getting the feel for using the correct amount of pressure so as not to leave chatter marks. Use lots of cutting fluid, such as Do Drill. It might work even better if the cutting surfaces were staggered. i used this tool to recrown a 25-06 bought the .257 brass guide to go with it turned it by hand stopping often to clean shavings with tooth brush used motor oil to keep lubricated took about 30 minutes cut aperfect crown very satisfied!!!!! I did not use the T handle you have to purchase separately with this product I simply threaded a nut on the end I had laying around and utilized a ratcheting wrench. This product cuts very well and evenly. With the .30 cal pilot and some motor oil, I was able to crown my barrel very well. What I didn't like is that though my .30 cal pilot worked, it seemed to fit slightly loose. That could also be normal. Overall this tool worked well. Produsentnr. : 100729 Herdet stål, snute kroningen verktøyet kutt svak (11° mindre enn kvadrat) mål skråkant på fat. Gir god zappe beskyttelse uten å gå for dypt. 90°-11° = 79 °, derav navnet. Åtte, presisjons-maskinert fløyter gir jevn, prat-fri kutt å eliminere ekstra lapping eller steining. ¼"-20 tråd passer Brownells munnkurv festing håndtak. Bruk med våre munnkurv pilotene for å sikre presis justering med ditt kjedelig. Tilgjengelig i Dim ½" och ¾" diameter å imøtekomme de fleste rifle/pistol fat diameter. 3/4" 79° Crown Cutter Herdet stål, snute kroningen verktøyet kutt svak (11° mindre enn kvadrat) mål skråkant på fat. Gir god zappe beskyttelse uten å gå for dypt. 90°-11° = 79 °, derav navnet. Åtte, presisjons-maskinert fløyter gir jevn, prat-fri kutt å eliminere ekstra lapping eller steining. ¼"-20 tråd passer Brownells munnkurv festing håndtak. Bruk med våre munnkurv pilotene for å sikre presis justering med ditt kjedelig. Tilgjengelig i Dim ½" och ¾" diameter å imøtekomme de fleste rifle/pistol fat diameter.